To grate the cauliflower, use a grater or place in a food-processor. The goal is to get the cauliflower in little bits so the cheese and egg go in between to bind it all together. Mix all of the ingredients listed above in a large bowl. On parchment paper, form a medium sized pizza base with the mixture, or several personal pizza, it’s up to you! Or, if you have a pizza pan, grease it and press the cauliflower mixture into the shape of the pan. This crust will not rise, because there is no flour, but don’t make it too thick or it won’t cook. Sprinkle the herbs on top. Place base on a stone, greased cookie sheet or greased pizza pan and let cook for 15-18 min. It should be browned. Remove pizza crust from the oven and let the crust cool while preparing the toppings. Place desired toppings (you may want to precook these as they will only be in the oven for a few minutes), sauce and cheese on the pizza and put back into the oven until the cheese is browned and bubbly, 3-4 minutes. Remove and let cool before cutting. Breast is Best for Babe! Two weeks ago I attended a seminar with Teresa Pitman, a La Leche League Leader for 28 years, the Executive Director of La Leche League Canada, certified childbirth educator and doula. The seminar was on the importance of breastfeeding and how healthcare practitioners can help their new-mothers be successful. Since this month is breast cancer awareness month I thought I would continue with the theme of breasts for this blog. As stated in my last post, breastfeeding can reduce the risk of breast cancer. I recommend that baby be fed exclusively with breastfeeding until the age of 5-6 months, after which solid foods can start to be introduced. It is important that baby is still breastfed until at least 1 year, some mothers continue breastfeeding until their toddler is 2, 3 or 4 years! It’s great to see momma’s who are so passionate about it. The unfortunate thing is, the majority of mothers stop breast feeding in the first 3 months. One question that frequently comes up is, how do I know my baby is getting enough milk? 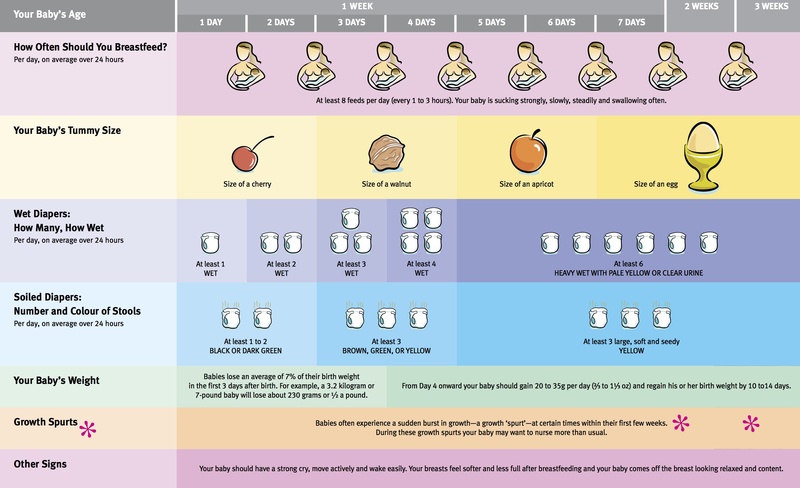 You know your baby is getting enough milk if they feed at least 8 times every 24 hours. That being said, don’t restrict the number of feeds to 8, and don’t restrict the length of the feeding. It is important not to swaddle your baby. Swaddling a baby makes them sleep longer, however when you are trying to establish a milk supply, this is not beneficial. Having baby’s hands free also allows you to watch for hand gestures that signal hunger. Another sign that your baby is getting enough milk is that your baby has enough wet diapers. Fluid in = fluid out. Refer to the chart below for the number of wet diapers a baby should have according to their age. If your baby is active and has a strong cry, and if your baby has a wet, pink mouth and bright eyes you know he/she is getting enough milk. If baby is not getting enough milk, this can be solved by increasing the frequency of feedings and increasing the amount of skin-skin contact with minimal separation. And of course myself. While not a certified lactation consultant I have had lots of training in breastfeeding! October is breast cancer awareness month, so lets talk about breasts baby! This blog isn’t just for women, MEN listen up too, for yourself and for your wife, girlfriend, mother or sister! Breast cancer is the most common cause of cancer among Canadian women. 1 in 9 women will develop breast cancer during her lifetime, and one in 29 will die of it. Don’t think I forgot about you men .. this year an estimated 200 men will be diagnosed with breast cancer and 55 will die from it. Pretty scary statistics if you ask me, but what can you do about it? I have breast cancer on both the maternal and paternal sides of my family which has me slightly terrified. Recently I have taken a look at my lifestyle and my diet and have done a complete overhaul to reduce my risk. Yes, there are genes, that increase your risk of developing breast cancer, the BRCA1 and BRCA2 genes. If you have one of them your chances increase by 60%. That being said, you do not need to have the breast cancer gene to be at risk for developing this disease. Your age, your gender, family and personal cancer history, starting menses early and starting menopause late are all risk factors. The good news is there are also risk factors that you can control: being overweight, taking the birth control pill, your diet, not having children, drinking alcohol, smoking, and not being physically active. Only 10% of cancer cases are genetic, the rest are related to your age, gender, and lifestyle (modifiable risk factors). Another interesting risk factor to take into consideration is the cosmetic products you use. A study completed earlier this year found traces of cancer causing chemicals in the breast tissue of women undergoing mastectomies. The study looked at the presence of parabens, a commonly used preservative in cosmetic products (lotions, make-up, soap, shampoo, deodorant). 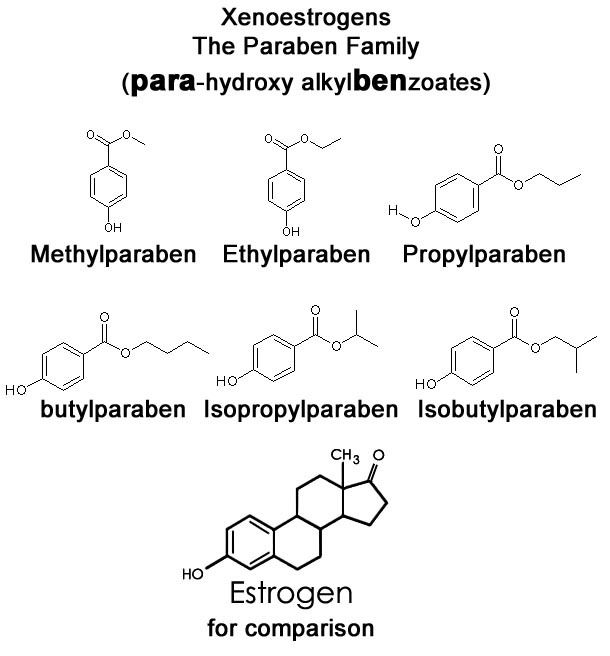 The chemical structure of a paraben mimics that of estrogen and is therefore called a xenoestrogen. Even if the cosmetic products were not used anywhere near the breasts, the chemical still found its way to the tissue because of the high density of estrogen receptors here. Our bodies make estrogen and now we are loading even more estrogen in to our system by using cosmetic products with parabens, by taking synthetic estrogens like the birth control pill, by storing our food in and eating out of plastic containers. You have the choice to reduce your risk of breast cancer. Read the labels of your face wash, your body lotion, and your make-up. Check out the website: http://www.ewg.org/skindeep/ to see just how toxic your cosmetics are. So you have decided to stop eating out of plastic containers and to stop using paraben containing cosmetics, good for you! BUT, what about the excess estrogens already in your body that have built up over years of cosmetic use. Estrogen is lipophilic, meaning it likes to be stored in fat. This is where a good detox comes in. Talk to your naturopathic doctor about how to effectively complete a cleanse. Barr, L., Metaxas, G., Harbach, C., Savoy, L., Darbre, P. (2012). Measurement of paraben concentrations in human breast tissue at serial locations across the breast from axilla to sternum. Journal of Applied Toxicology, 32(2): 219-232. Doulas have been around for hundreds of thousands of years. Unfortunately with the introduction of modern medicine, the tradition of having a supportive woman attend your birth has been lost. “Doula” is greek for “a woman who serves”. Traditionally women of the extended family or women in the community would gather together at a birth to provide emotional support the the labouring woman. In today’s world, family is spread out all over the globe, and having all of your female neighbours attend your birth is rather frightening! A modern day doula is a woman who has been trained to provide emotional, physical and informational support to both mom and her partner, prior to, during and after labour. It is not the doulas role to replace the partner, rather to compliment and enhance their experience. Countless studies show that having a doula present during a woman’s labour results in a substantial reduction in interventions and complications. How does a doula accomplish all of this you ask? By educating their clients about what to expect during labour, common problems that arise, tests that need to be preformed, and interventions that may be used the expecting couple is able to form a birth plan that suits their needs. The doula then acts as a voice for the couple. It is good to have a birth plan, however it is also important to know that there will be bumps along the road and that plan may have to change. A doula also provides natural pain reduction by counselling the mother about her fears, teaching the mother breathing techniques, using aromatherapy, massage, and suggesting other techniques learned through her training. Having a doula who is also a naturopathic doctor provides the added benefit of using acupuncture to stimulate contractions, teas to tonify the uterus, homeopathy to induce labour and cope with emotional distress, and topical creams to aid in healing. During the post partum period a doula helps mom with breastfeeding and continues to provide emotional support. Bringing baby home can be a difficult transition, but having a doula there to help makes the transition easier. Major changes are taking place in the dynamics of a birthing couple. Husbands and partners are starting to take a more active role in the whole process. However, some may feel that this is a huge expectation and would rather enjoy the experience than have the pressure of trying to remember everything they learnt in childbirth education classes or pregnancy books they read. Having a doula as part of your birth team allows the partner to participate in a way that makes him/her feel comfortable. The partner can be the main source of support, the doula can be the main source of support, or the doula can teach the partner how to be involved in the process. It is the doula’s job to meet the partner where he or she is when it comes to their fears, and expectations of the delivery. Even though they are not the ones physically delivering the child, they are still a large part of the experience. What if I want an epidural or a hospital birth? I will support you in what ever you choose. If you want an epidural, I will support you. If you want to transfer from your home birth to a hospital, I will support you. If you choose to have an OB, I will also support you. This is your birth so you make the decisions. It is not my job to judge your decisions, rather to ensure the experience is satisfying to you and a positive memory you will cherish for years. Can a doula support me if I require a Cesarean section? If you require a c-section, usually only one person is allowed with you in the operating room. Normally, most women choose their partner to accompany them. The decision is up to you. While you are in the operating room, your doula can update your family, replenish food and drink for everyone, or watch older siblings. Post-surgery, the key role of the doula is to provide emotional support. Any surgery can cause emotional distress for the mother and her partner. Having a doula who is also a naturopathic doctor widens the scope of practice to include the use of natural remedies to aid in healing and recovery. It is important to remember that a c-section, even if unplanned, can still be wonderful experience. What if I can’t afford a doula? It is my belief that every woman deserves to have a doula at her birth. While I have set fees for my services, I am willing to make exceptions and provide a sliding scale, just ask! I hope by reading this I have convinced you of the importance of having a doula at your birth. As a doula and naturopathic doctor I have attended births of all kinds. It is an honour to be part of a birth experience and I cherish each and every one. It is my passion to work with expecting mothers, to empower them to take charge of their bodies, and to help them have the best birth possible. When I give people recipes I don’t like giving them specific measurements and quantities of ingredients. Cooking is an art, it’s about adding as much or as little of an ingredient as resonates with you at that exact moment. While the brown rice pasta is cooking, saute the broccoli and onions in a frying pan with the chopped garlic until fragrant, the brocoli is bright green and the onions are clear. Remove from heat and add the drained pasta. Stir in the enough goat cheese and olive oil. Start with a small amount and slowly increase until it looks right to you. The cheese will melt and mix with the olive oil to form a thick sauce. Voila, you have a delicious and healthy mac and cheese that everyone will love!